Are there portlets you need displayed in the same location on all pages using a particular layout template? Perhaps you want to prevent others from disrupting the Feng Shui you’ve generated with your design? You can embed portlets in layout templates, ensuring that specified portlets always display in consistent locations on your pages. Users can minimize embedded portlets but can’t move or remove them. Whether instanceable or non-instanceable, core portlets and custom portlets you created with the Plugins SDK can be embedded in layout templates. Let’s embed some portlets in our Columns 1 4 1 layout template. We’ll place the navigation portlet and search portlet in the first and last columns of our layout template’s middle row. Additionally, we’ll embed a custom portlet in the template’s upper and lower rows. Portlet ID: The portlet’s name, <portlet-name>, found in docroot/WEB-INF/portlet.xml. For core portlets, find the name in liferay-portal/portal-web/docroot/WEB-INF/liferay-portlet.xml. Core vs. Custom: Specify whether the portlet is a core portlet or custom. Instanceable: Specify whether multiple instances of the portlet can exist in the portal. Web Application Context - Required for custom portlets only. Log into your Liferay Portal. Go to the portlet’s Look and Feel → Advanced Styling to find the context in the Fully Qualified Portlet ID (FQPI). The context is the portion of the Portlet ID string that follows WAR_. The Web Application Context in the following figure is myhelloworldportlet. What would a page using our Columns 1 4 1 layout template look like? 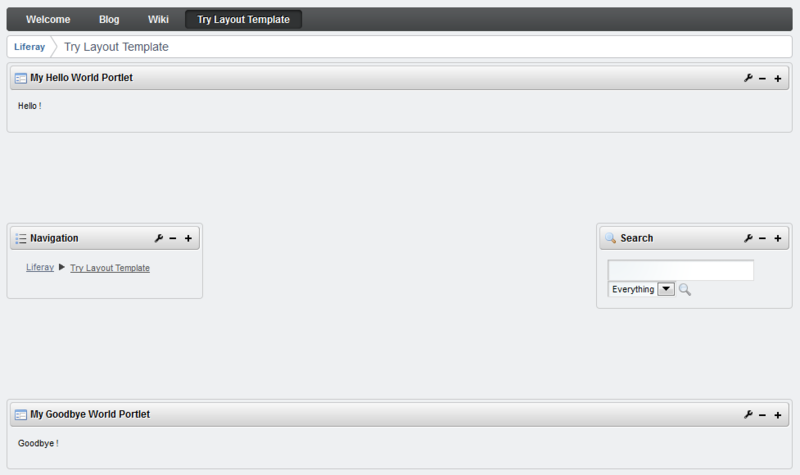 Check out the following figure for a screenshot of our layout template with its embedded portals. See how simple it is to embed portlets in your pages? Wouldn’t it be nice to have an organized reference of available layout template variables? You’re in luck! We’ll dive into available variables next!